However, the same report pointed to real and present dangers for the global capitalist economy arising from core problems not addressed, or in some cases worsened, by the crisis and austerity policies. These dangers have the potential to drag down the world economy and impact on all countries, including Ireland. Chief among these dangers perhaps is the possibility of outright recession in the Eurozone. Predicting a 0.8% growth for the Eurozone in 2014, the IMF report assigned a “near 40%” chance of outright recession and a 30% chance of Japanese-style deflation. The Eurozone economies grew by a mere 0.3% in September. The German, French and Italian economies are at a virtual standstill. Failure by European Central Bank President, Mario Draghi, to detail asset buying plans to ward off deflation recently led to the Stoxx Europe 600 Index plunging 11% on its June aggregates. German government opposition to bold reflationary policies has the potential to cause sharp and open division with other European governments, as well as the US Administration and the IMF itself. But European capitalism is caught on the horns of a dilemma – bold reflation on the basis of capitalism risks worsening state indebtedness and reigniting a Eurozone crisis. Japan – the world’s third largest economy – is predicted to grow by a mere 0.9% this year and less again in 2015. Meanwhile, growth in “emerging markets” continues to slow. Chinese growth for Q3 2014 was its slowest quarterly growth since Q1 2009 five and half years ago, though still a significant 7.3%. Brazil’s predicted growth at 0.3% brings it close to outright recession. The Irish economy has particularly close ties with the British and US economies, which have escaped the worst problems of the Eurozone economies and the “emerging markets” up until recently. In the US, the economy is expected to grow 3% in Q3 and job openings are at a 13-year high. But the Quantitative Easing programme which saw the US state inject $3.5 trillion into the economy in recent years, ends in October and takes a major “stabiliser” away from the US economy. Meanwhile, volatility in US financial markets has resurfaced with stock prices falling 4% within a month and fears that this can cause greater difficulty in accessing borrowing markets. 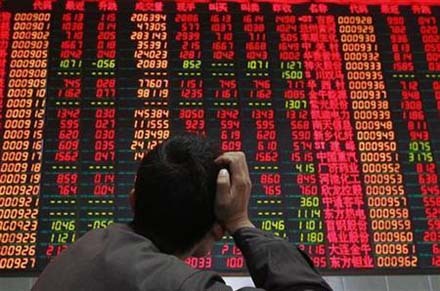 Turmoil in the Middle East, the Ukraine/Russia crisis and the threat of a worldwide Ebola pandemic are adding to market jitters. In light of all this, the IMF have revised their forecasts for 2014 world economic growth downwards – from 3.7% to 3.3%. Any further downward revision would be a prediction of lower growth than 2013, hardly a picture of a world economy motoring its way back to rude good health. It would be wrong to conclude from all of this that the world economy is definitely set for a new crash and downward spiral in the immediate short term. But clearly, capitalism’s global economic recovery is beset by multiple problems. Faltering growth, low growth, stagnation and outright recession are all potentially part of the equation. In light of all this Taoiseach Enda Kenny’s recent claim that Ireland is set for 10 years of economic growth is mere fantasy economics. The Irish capitalist economy is an extremely open economy and the prevailing winds from the global economy can and will have a major and, ultimately, a decisive effect. The Irish economic recovery is replete with its own weaknesses and contradictions. But even if these do not derail the recovery from within international developments can do so, if not in the immediate short term, then perhaps over a slightly longer period. Real recovery will not be delivered on the basis of capitalism but only on the basis of socialist policies which go beyond the limits of a failed and failing system.